Justin Barth is the director of education for the Glacier Institute and oversees the Institute’s Field Camp site in West Glacier. Barth is also an avid trail runner and enjoys running to Glacier’s lookouts when the trails aren’t congested with grizzlies during huckleberry season. Justin grew up in Kalispell and visited the Institute’s Big Creek Outdoor Education Center in sixth grade. 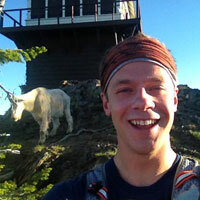 He will lead a four-part field hiking series of to the lookouts of Glacier National Park in the summer of 2015.